No doubt, you’ve found your way to our nifty little website because you love making slime! Guess what? We do too. That’s why we are always testing out cool homemade slime recipes for you. 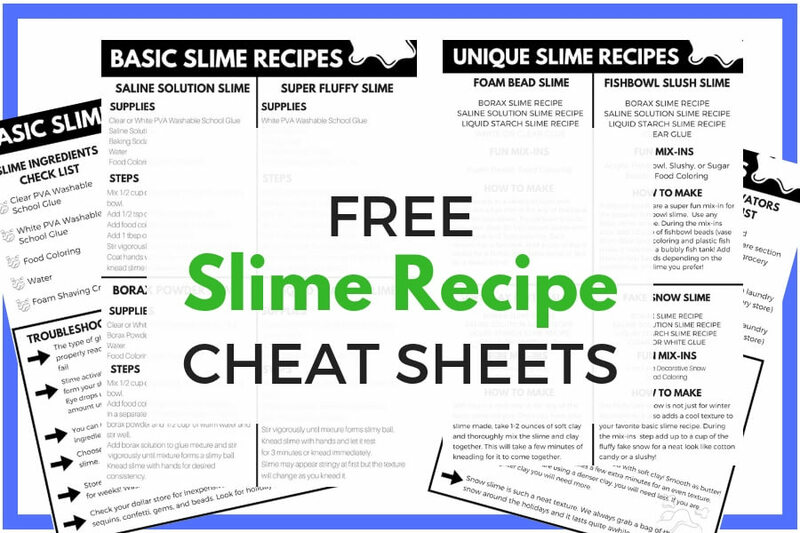 Today, I put together a free printable slime recipes sheet featuring 5 of our favorite slimes. Kids love making homemade slime for both science and sensory play all in one! 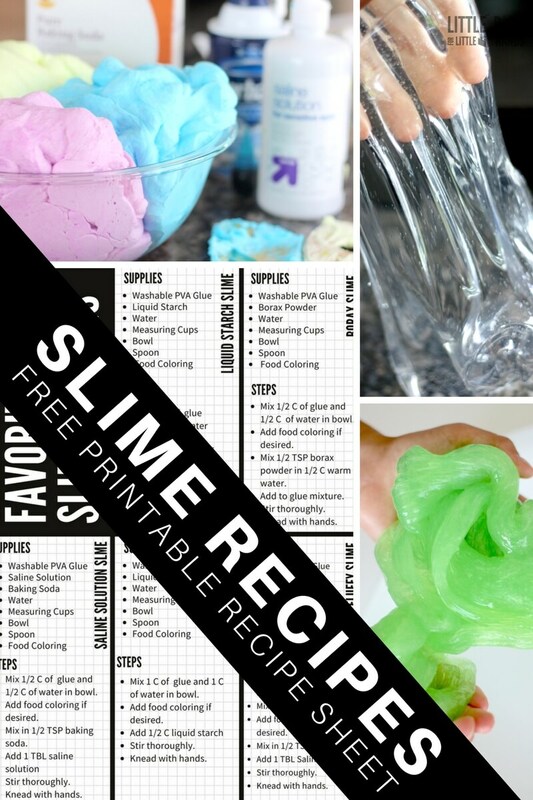 Slime is a ton of fun to make, and it is definitely not as difficult as you might think! We have tested our recipes dozens of times. Just make sure to follow the recipes closely and use the right ingredients. Not all glue is created the same! 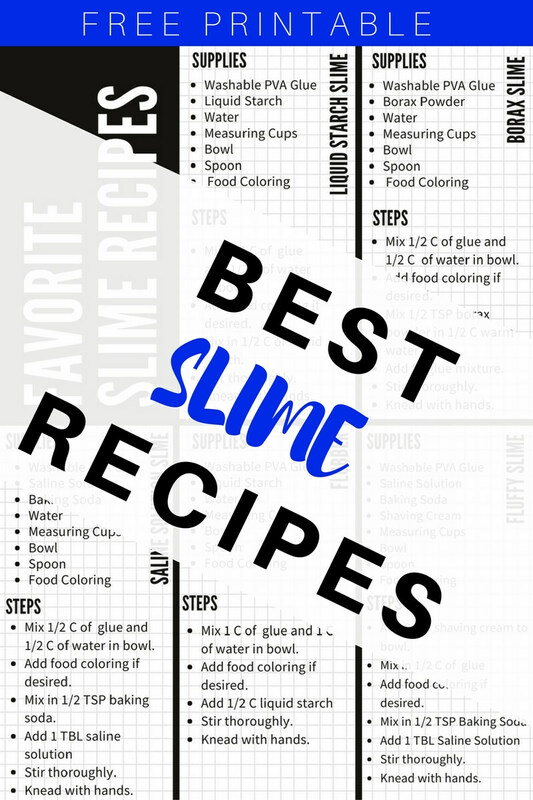 We also have a handy list of alternative slime recipes that include fiber slimes, candy slimes, and other variations of slimes that are chemical free. 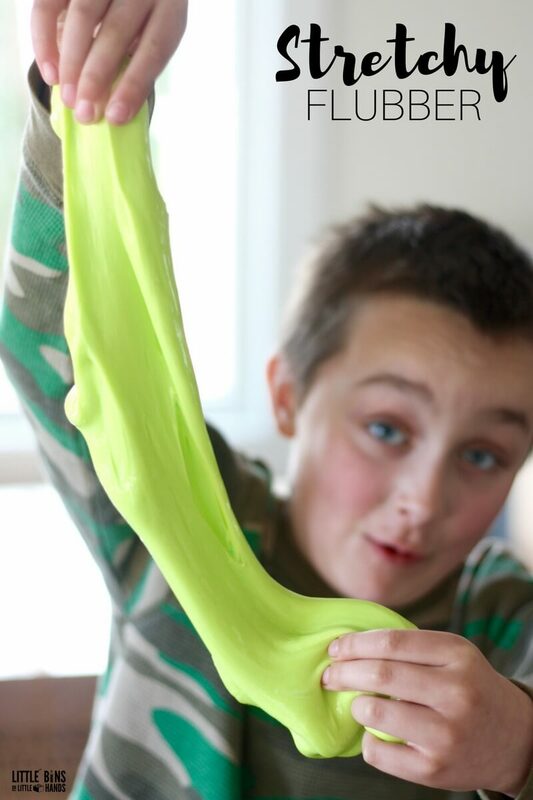 Slime is also terrific tactile sensory play for kids who love a real hands on experience.It’s such a unique texture, and we have quite a few uniquely textured slimes like our homemade floam slime! Watch a slimy video! We have more slime making videos here. The base for most of our slimes uses one of our most basic slime recipes (saline solution slime recipe) which is clear glue, water, baking soda, and saline solution. My son loves slime, the stretchier the better. MAKE SLIME. IT’S A MUST DO SCIENCE PROJECT! 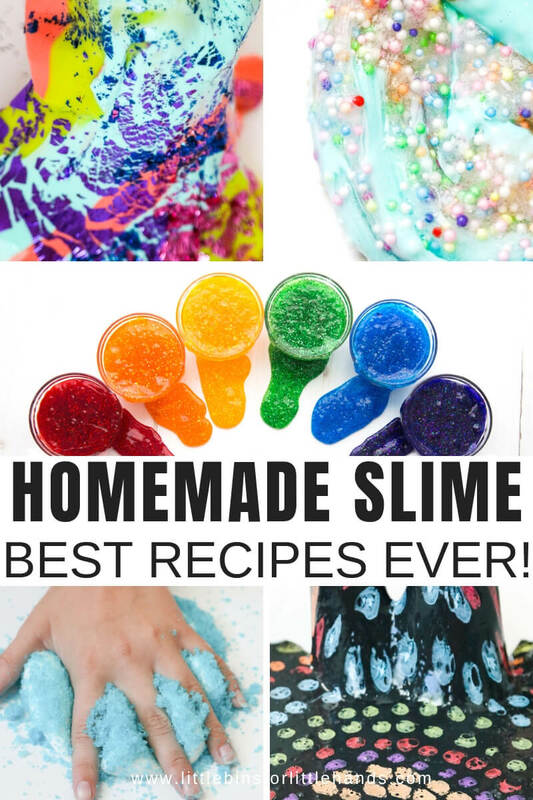 CLICK HERE FOR COOL SLIMY IDEAS! I love your site! I just made the Crystal slime with my granddaughter. She loved it. I did change one ingredient. I used Elmer’s classic glitter glue. It worked beautifully! Thanks again for all of your ideas making science fun for kids and adults! I have tried to make this slime 3 different ways now and it just stays liquid. Can you please tell me exactly what brand and type of glue you’re using? I’ve tried Elmer’s washable clear glue as well as Elmer’s white school glue. I’ve also tried saline and liquid starch thinking that maybe I’m just using something wrong! What liquid starch or saline do you use as well? All 3 ways have not worked! Hmm…. If you would like to email me at [email protected] , I would be able to help you better! I had the same issue at first, but I changed the saline solution and it worked perfectly. I used “Re-nu Fresh” saline solution, Elmer’s washable clear glue, baking soda, and water. I think the trick is in the saline solution. For it to work correctly it must contain boric acid and sodium borate. Can you have kids add glitter or sparlke items after clear slime is made? I was thinking of putting clear slime in sandwich bag, and a variety of sparkle items, food coloring, etc..and the kids could make a choice of what they wanted to have their slime look like. A word of advice, I would make the saline solution slime recipe and give it a tiny hint of color. The borax slime recipe can be finicky and I think t makes a better science demonstration then a fun play material. Adding food coloring after the fact is definitely harder and messier. However, glitter, sequins, and confetti are fine to add later on! My kid are making a slime with your recipe. But, next day, it turns really watery. ( The container has a water from slime.) How can we fix this issue ? He was making the crystal glue slime & floam slime ). You need to make sure the ingredients in the saline read as boric acid and sodium borate. Just made two batches today for my new mud slime. Email me at [email protected] for direct help. What brands are you using for glue? Thanks for your reply. My saline solution is having both ingredients. We will make it again and let you know if it doesn’t work well again. Make sure you are mixing the glue and water, adding a 1/2 tsp of baking soda and mixing, then adding the tablespoon of saline solution. Whip it up somewhat fast until it forms a sticky glob it might take 30 secs. If its still not coming together, try a bit more saline. On a very rare occasion I have gotten an old batch of glue which just prevents the whole thing from working. Did you use Elmer’s washable PVA school glue or another brand? This also can be an issue. My kids were missed the amount of baking soda. They were using TBS for baking soda. So, now, they have a perfect slime ! Sorry but thanks for your great recipe !! !